Lake Ohrid is considered to be the oldest existing lake in Europe. Moreover, it has a very high degree of endemic biodiversity. During a drilling campaign at Lake Ohrid in 2013, a 569 m long sediment sequence was recovered from Lake Ohrid. The ongoing studies of this record provide first important information on the environmental and evolutionary history of the lake and the reasons for its high endimic biodiversity. This study aims to reconstruct the climate evolution of the Mediterranean region during the Holocene from pollen data and model outputs. The model- and pollen-inferred precipitation estimates show overall agreement: the eastern Medit. experienced wetter-than-present summer conditions during the early–late Holocene. This regional climate model highlights how the patchy nature of climate signals and data in the Medit. may lead to stronger local signals than the large-scale pattern suggests. Chronology is fundamental in paleoclimatology for understanding timing of events and their origin. In this paper we try to obtain a more detailed chronology for the interval comprised between ca. 140 and 70 ka for the DEEP core in Lake Ohrid using regional independently-dated archives (i.e. speleothems and/or lacustrine succession with well-dated volcanic layers). This allows to insert the DEEP chronology within a common chronological frame between different continental and marine proxy records. The magnetic record from Lake Ohrid reflects a strong change in geochemical conditions in the lake. Before 320 ka glacial sediments contain iron sulfides, while later glacials are dominated by siderite. Superimposed on this large-scale pattern are climatic induced changes in the magnetic mineralogy. Glacial and stadial sediments are characterized by relative increases of high- vs. low-coercivity minerals which relate to enhanced erosion in the catchment, possibly due to a sparse vegetation. Lake Ohrid (FYROM/Albania) is the deepest, largest and oldest lake in Europe. To understand the climatic and environmental evolution of its area, a palynological study was undertaken for the last 500 ka. We found a correspondence between forested/non-forested periods and glacial-interglacial cycles of marine isotope stratigraphy. Our record shows a progressive change from cooler and wetter to warmer and dryer interglacial conditions. This shift is also visible in glacial vegetation. Based on the study of ancient microfossils, such as pollen and spores, this paper explores climate change in a Mediterranean island context. Using a multi-disciplinary approach this original research corroborates existing archaeological and historical data. It also uses comparative data from elsewhere in the central Mediterranean to ensure that the current research is placed within the appropriate geographic context. Lake Ohrid is situated in the southern Balkans between Albania and Macedonia. It is a unique ecosystem with remarkable biodiversity and a sediment record of past climates that goes back more than a million years. Detailed reconstructions of past climate development and human alteration of the environment require underpinned and so in this study we go the present-day lake vegetation and catchment soils and test new proxies over one of the known recent cooling events of the region 8200 years ago. In this paper we use two climate models to test how Earth’s vegetation responded to changes in climate over the last 120 000 years, looking at warm interglacial climates like today, cold ice-age glacial climates, and intermediate climates. The models agree well with observations from pollen, showing smaller forested areas and larger desert areas during cold periods. Forests store most terrestrial carbon; the terrestrial carbon lost during cold climates was most likely relocated to the oceans. Gamma ray (GR) fluctuations and K values from downhole logging data obtained in the sediments of Lake Ohrid correlate with the global climate reference record (LR04 stack from δ18O) (Lisiecki and Raymo, 2005). GR and K values are considered a reliable proxy to depict glacial-interglacial cycles and document warm, humid and cold, drier periods. A robust age model for the downhole logging data over the past 630kyr was established and will play a crucial role for other working groups. Lake Vida is one of the largest lakes in the McMurdo dry valleys, Antarctica, and has the thickest known ice cover of any lake on Earth. For the first time, Lake Vida was drilled to a depth of 27m. With depth the ice cover changes from freshwater ice to salty ice interspersed with thick sediment layers. It is hypothesized that the repetition of sediment layers in the ice will reveal climatic and hydrologic variability in the region over the last 1000--3000 years. The Last Interglacial was warmer, with a reduced Greenland Ice Sheet (GIS), compared to the late Holocene. We analyse – through climate model simulations – the impact of a reduced GIS on the global surface air temperature and find a relatively strong warming especially in the Northern Hemisphere. These results are then compared to temperature reconstructions, indicating good agreement with respect to the pattern. However, the simulated temperatures underestimate the proxy-based temperatures. In this paper we explore the permafrost–ice-sheet interaction using the fully coupled climate–ice-sheet model CLIMBER-2 with the addition of a newly developed permafrost module. We find that permafrost has a moderate but significant effect on ice sheet dynamics during the last glacial cycle. In particular at the Last Glacial Maximum the inclusion of permafrost leads to a 15m sea level equivalent increase in Northern Hemisphere ice volume when permafrost is included. Allen, J. R. M., Watts, W. A., and Huntley, B.: Weichselian palynostratigraphy, palaeovegetation and palaeoenvironment: the record from Lago Grande di Monticchio, southern Italy, Quatern. Int., 73/74, 91–110, 2000. Bard, E., Delaygue, G., Rostek, F., Antonioli, F., Silenzi, S., and Schrag, D. P.: Hydrological conditions over the western Mediterranean basin during the deposition of the cold Sapropel 6 (ca. 175 Kyr BP), Earth Planet. Sc. Lett., 202, 481–494, 2002. Bertini, A., Sadori, L., Combourieu-Nebout, N., Donders, T. H., Kouli, K., Koutsodendris, A., Joannin, S., Masi, A., Mercuri, A. M., Panagioutopulos, K., Peyron, O., Sinopoli, G., Torri, P., Zanchetta, G., Francke, A., and Wagner, B.: All together now: an international palynological team documents vegetation and climate changes during the last 500 kyr at lake Ohrid (SE Europe), Alp. Mediterr. Quaternary, 29, 201–210, 2016. Birks, H. J. B., Heiri, O., Seppä, H., and Bjune, A. E.: Strengths and weaknesses of quantitative climate reconstructions based on late Quaternary biological proxies, Open Ecol. J., 3, 68–110, 2010. Bond, G. C., and Lotti, R.: Iceberg discharges into the North Atlantic on millennial time scales during the last glaciation, Science, 267, 1005–1010, 1995. Bond, G. C., Heinrich, H., Broecker, W., Labeyrie, L., McManus, J., Andrews, J., Huon, S., Jantschik, R., Clasen, S., Simet, C., Tedesco, K., Klas, M., Bonani, G., and Ivy, S.: Evidence for massive discharges of icebergs into the North Atlantic Ocean during the last glacial period, Nature, 360, 245–249, 1992. Bordon, A.: Dynamique de la vegetation et variations climatiques dans les Balkans au cours du dernier cycle climatique à partir des sequences polliniques des lacs Maliq et Ohrid (Albanie), Université de Franche-Comté, Phd thesis, 2008. Brewer, S., Guiot, J., Sánchez-Goñi, M. F., and Klotz, S.: The climate in Europe during the Eemian: a multi-method approach using pollen data, Quaternary Sci. Rev., 27, 2303–2315, 2008. Cheddadi, R., Mamakowa, K., Guiot, J., Beaulieu, J. L. de, Reille, M., Andrieu, V., Granoszewski, W., and Peyron, O.: Was the climate of the Eemian stable? A quantitative climate reconstruction from seven European pollen records, Palaeogeogr. Palaeocl., 143, 73–85, 1998. Dansgaard, W., Johnsen, S. J., Clausen, H. B., Dahl, J. D., Gundestrup, N. S., Hammer, C. U., Hvidberg, C. S., Steffensen, J. P., Sveinbjornsdottir, A. E., Jouzel, J., and Bond, G.: Evidence for general instability of past climate from a 250-kyr ice-core record, Nature, 364, 218–220, 1993. De Abreu, L., Shackleton, N. J., Schönfeld, J., Hall, M., and Chapman, M.: Millennial-scale oceanic climate variability off the Western Iberian margin during the last two glacial periods, Mar. Geol., 196, 1–20, 2003.
de Beaulieu, J.-L. and Reille, M.: A long upper Pleistocene pollen record from Les Echets near Lyon, France, Boreas, 13, 111–132, 1984.
de Beaulieu, J.-L. and Reille, M.: The transition from temperate phases to stadials in the long Upper Pleistocene sequence from les Echets (France), Palaeogeogr. Palaeocl., 72, 147–159, 1989.
de Beaulieu, J. L. and Reille, M.: Long Pleistocene pollen sequences from the Velay Plateau (Massif Central, France), Veg. Hist. Archaeobot., 1, 233–242, 1992. Demény, A., Czuppon, G., Siklósy, Z., Leél-Őssy, S., Chuan-Chou Shen, K. L., and Gulyás, K.: Stable isotope compositions of speleothems from the last interglacial – Spatial patterns of climate fluctuations in Europe, Quaternary Sci. Rev., 161, 68–80, 2017. Drysdale, R. N., Zanchetta, G., Hellstrom, J. C., Fallick, A. E., and Zhao, J. X.: Stalagmite evidence for the onset of the Last Interglacial in southern Europe at 129±1 ka, Geophys. Res. Lett., 32, 1–4, 2005. Drysdale, R. N., Hellstrom, J. C., Zanchetta, G., Fallick, A., Goni, M. S., Chouchoud, I. McDonald, J., Maas, R., Lohman, G., and Isola, I.: Evidence for obliquity forcing of glacial termination II, Science, 325, 1527–1531, 2009. Fauquette, S., Guiot, J., Menut, M., Beaulieu, J.-L. de, Reille, M., and Guenet, P.: Vegetation and climate since the last interglacial in the Vienne area (France), Global Planet. Change, 20, 1–17, 1999. Field, M. H., Huntley, B., and Müller, H.: Eemian climate fluctuations observed in a European pollen record, Nature, 371, 779–783, 1994. Francke, A., Wagner, B., Just, J., Leicher, N., Gromig, R., Baumgarten, H., Vogel, H., Lacey, J. H., Sadori, L., Wonik, T., Leng, M. J., Zanchetta, G., Sulpizio, R., and Giaccio, B.: Sedimentological processes and environmental variability at Lake Ohrid (Macedonia, Albania) between 637 ka and the present, Biogeosciences, 13, 1179–1196, https://doi.org/10.5194/bg-13-1179-2016, 2016. Genty, D., Blamart, D., Ouahdi, R., and Gilmour, M.: Precise dating of Dansgaard-Oeschger climate oscillations in western Europe from stalagmite data, Nature, 421, 833–837, 2003. Govin, A., Capron, E., Tzedakis, P. C., Verheyden, S., Ghaleb, B., Hillaire-Marcel, C., St-Onge, G., Stoner, G. S., Bassinot, F., Bazin, L., Blunier, T., Comborieu-Nebout, N., and Ouahabi, E. I.: Sequence of events from the onset to the demise of the Last Interglacial: Evaluating strengths and limitations of chronologies used in climatic archives, Quaternary Sci. Rev., 129, 1–36, 2015. GRIP Members: Climate instability during the last interglacial period recorded in the GRIP ice core, Nature, 364, 203–207, 1993. Guiot, J.: Late Quaternary climatic change in France estimated from multivariate pollen time series, Quaternary Res., 28, 100–118, 1987. Guiot, J.: Methodology of palaeoclimatic reconstruction from pollen in France, Palaeogeogr. Palaeocl., 80, 49–69, 1990. Guiot, J., Pons, A., Beaulieu, J. L. de, and Reille, M.: A 140,000-year continental climate reconstruction from two European pollen records, Nature, 338, 309–313, 1989. Guiot, J., Beaulieu, J. L. de, Cheddadi, R., David, F., Ponel, P., and Reille, M.: The climate in Western Europe during the last Glacial/Interglacial cycle derived from pollen and insect remains, Palaeogeogr. Palaeocl., 103, 73–93, 1993. Holtvoeth, J., Vogel, H., Valsecchi, V., Lindhorst, K., Schouten, S., Wagner, B., and Wolff, G. A.: Linear and non-linear responses of vegetation and soils to glacial-interglacial climate change in a Mediterranean refuge, Sci. Rep., 7, 8121, https://doi.org/10.1038/s41598-017-08101-y, 2017. Juggins, S.: Package “rioja” – Analysis of Quaternary Science Data, version 0.9-6, The Comprehensive R Archive Network, 2016. Kaspar, F., Kühl, N., Cubasch, U., and Litt, T.: A model-data comparison of European temperatures in the Eemian interglacial, Geophys. Res. Lett., 32, L11703, https://doi.org/10.1029/2005GL022456, 2005. Keigwin, L. D., Curry, W. B., Lehman, S. J., and Johnsen, S.: The role of the deep ocean in North Atlantic climate change between 70 and 130 kyr ago, Nature, 371, 323–325, 1994. Klotz, S., Guiot, J., and Mosbrugger, V.: Continental European Eemian and early Würmian climate evolution: comparing signals using different quantitative reconstruction approaches based on pollen, Global Planet. Change, 36, 277–294, 2003. Klotz, S., Müller, U., Mosbrugger, V., Beaulieu, J. L. de, and Reille, M.: Eemian to early Würmian climate dynamics: history and pattern of changes in Central Europe, Palaeogeogr. Palaeocl., 211, 107–126, 2004. Kopp, R. E., Simons, F. J., Mitrovica, J. X., Maloof, A. C., and Oppenheimer, M.: Probabilistic assessment of sea level during the last interglacial, Nature, 462, 863–867, 2009. Kühl, N. and Litt, T.: Quantitative time series reconstruction of Eemian temperature at three European sites using pollen data, Veget. Histor. Archaeobot., 12, 205–214, 2003. Kühl, N., Moschen, R., Wagner, S., Brewer, S., and Peyron, O.: A multiproxy record of Late Holocene natural and anthropogenic environmental change from the Sphagnum peat bog Dürres Maar, Germany: implications for quantitative climate reconstructions based on pollen, J. Quaternary Sci., 25, 675–688, 2010. Leicher, N., Zanchetta, G., Sulpizio, R., Giaccio, B., Wagner, B., Nomade, S., Francke, A., and Del Carlo, P.: First tephrostratigraphic results of the DEEP site record from Lake Ohrid (Macedonia and Albania), Biogeosciences, 13, 2151–2178, https://doi.org/10.5194/bg-13-2151-2016, 2016. Lézine, A. M., Von Grafenstein, U., Andersen, N., Belmecheri, S., Bordon, A., Caron, B., Cazet, J. P., Erlenkeuser, H., Fouache, E., Grenier, C., Huntsman-Mapila, P., Hureau-Mazaudier, D., Manelli, D., Mazaud, A., Robert, C., Sulpizio, R., Tiercelin, J. J., Zanchetta, G., and Zeqollari, Z.: Lake Ohrid, Albania, provides an exceptional multi-proxy record of environmental changes during the last glacial–interglacial cycle, Palaeogeogr. Palaeocl., 287, 116–127, 2010. Lindhorst, K., Vogel, H., Krastel, S., Wagner, B., Hilgers, A., Zander, A., Schwenk, T., Wessels, M., and Daut, G.: Stratigraphic analysis of lake level fluctuations in Lake Ohrid: an integration of high resolution hydro-acoustic data and sediment cores, Biogeosciences, 7, 3531–3548, https://doi.org/10.5194/bg-7-3531-2010, 2010. Lisiecki, L. E. and Raymo, M. E.: A Pliocene–Pleistocene stack of 57 globally distributed benthic δ18O records, Paleoceanography, 20, 1003, https://doi.org/10.1029/2004PA001071, 2005. Litt, T., Junge, F. W., and Böttger, T.: Climate during the Eemian in north-central Europe a critical review of the palaeobotanical and stable isotope data from central Germany, Veget. Hist. Archaeobot., 5, 247–256, 1996. Martrat, B., Grimalt, J. O., Lopez-Martinez, C., Cacho, I., Sierro, F. J., Flores, J. A., Zahn, R., Canals, M., Curtis, J. H., and Hodell, D. A.: Abrupt temperature changes in the Western Mediterranean over the past 250,000 years, Science, 306, 1762–1765, 2004. Martrat, B., Grimalt, J. O., Shackleton, N. J., de Abreu, L., Hutterli, M. A., and Stocker, T. F.: Four climate cycles of recurring deep and surface water destabilizations on the Iberian margin, Science, 317, 502–507, 2007. Martrat, B., Jimenez-Amat, P., Zahn, R., and Grimalt, J. O.: Similarities and dissimilarities between the last two deglaciations and interglaciations in the North Atlantic region, Quaternary Sci. Rev., 99, 122–134, 2014. Maslin, M. A. and Tzedakis, P. C.: Last Interglacial Gets Sudden Chill, Eos, 77, 353–354, 1996. Mauri, A., Davis, B. A. S., Collins, P. M., and Kaplan, J. O.: The climate of Europe during the Holocene: a gridded pollen-based reconstruction and its multi-proxy evaluation, Quaternary Sci. Rev., 112, 109–127, 2015. McManus, J. F., Bond, G. C., Broecker, W. S., Johnsen, S., Labeyrieš, L., and Higgins, S.: High-resolution climate records from the North Atlantic during the last interglacial, Nature, 371, 326–329, 1994. McManus, J. F., Oppo, D. W., and Cullen, J. L.: A 0.5-million-year record of millennial-scale climate variability in the North Atlantic, Science, 283, 971–975, 1999. Milner, A. M., Roucoux, K. H., Collier, R. E. L., Müller, U. C., Pross, J., and Tzedakis, P. C.: Vegetation responses to abrupt climatic changes during the Last Interglacial Complex (Marine Isotope Stage 5) at Tenaghi Philippon, NE Greece, Quaternary Sci. Rev., 154, 169–181, 2016. Mokeddem, Z., McManus, J. F., and Oppo, D. W.: Oceanographic dynamics and the end of the last interglacial in the subpolar North Atlantic, P. Natl. Acad. Sci. USA, 111, 11263–11268, 2014. Müller, U. C., Pross, J., Tzedakis, P. C., Gamble, C., Kotthoff, U., Schmiedl, G., Wulf, S., and Christanis, K: The role of climate in the spread of modern humans into Europe, Quaternary Sci. Rev., 30, 273–279, 2011. NGRIP Members: High-resolution record of Northern Hemisphere climate extending into the last interglacial period, Nature, 431, 147–151, 2004. Okuda, M., Yasuda, Y., and Setoguchi, T.: Middle to Late Pleistocene vegetation history and climatic changes at Lake Kopais, Southeast Greece, Boreas, 30, 73–82, 2001. Oppo, D. W., McManus, J. F., and Cullen, J. L.: Evolution and demise of the Last Interglacial warmth in the subpolar North Atlantic, Quaternary Sci. Rev., 25, 3268–3277, 2006. Otto-Bliesner, B. L., Rosenbloom, N., Stone, E. J., McKay, N. P., Lunt, D. J., Brady, E. C., and Overpeck, J. T.: How warm was the last Interglacial? New model-data comparisons, Philos. T. R. Soc. A, 371, 20130097, https://doi.org/10.1098/rsta.2013.0097, 2013. Overpeck, J. T., Otto-Bliesner, B. L., Miller, G. H., Muhs, D. R., Alley, R. B., and Kiehl, J. T.: Paleoclimatic evidence for future ice-sheet instability and rapid sea-level rise, Science, 311, 1747–1750, 2006. Panagiotopoulos, K., Böhm, A., Leng, M. J., Wagner, B., and Schäbitz, F.: Climate variability over the last 92 ka in SW Balkans from analysis of sediments from Lake Prespa, Clim. Past, 10, 643–660, https://doi.org/10.5194/cp-10-643-2014, 2014. Peyron, O., Guiot, J., Cheddadi, R., Tarasov, P., Reille, M., Beaulieu, J. L. de, Bottema, S., and Andrieu, V.: Climatic reconstruction in Europe for 18,000 yr BP from pollen data, Quaternary Res., 49, 183–196, 1998. Peyron, O., Bégeot, C., Brewer, S., Heiri, O., Magny, M., Millet, L., Ruffaldi, P., Van Campo, E., and Yu, G.: Lateglacial climate in the Jura Mountains based on pollen, lake-levels, and chironomids, Quaternary Res., 64, 197–211, 2005. 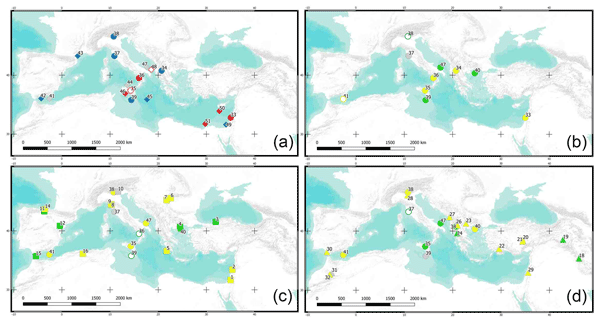 Peyron, O., Goring, S., Dormoy, I., Kotthoff, U., Pross, J., Beaulieu, J. L. de, Drescher-Schneider, R., Vannière, B., and Magny, M.: Holocene seasonality changes in the central Mediterranean region reconstructed from the pollen sequences of Lake Accesa (Italy) and Tenaghi Philippon (Greece), Holocene, 21, 131–146, 2011. Pickarski, N., Kwiecien, O., Djamali, M., and Litt, T.: Vegetation and environmental changes during the last interglacial in eastern Anatolia (Turkey): a new high-resolution pollen record from Lake Van, Palaeogeogr. Palaeocl., 435, 145–158, 2015. Pons, A., Guiot, J., Beaulieu, J. L. de, and Reille, M.: Recent contributions to the climatology of the last glacial–interglacial cycle based on French pollen sites, Quaternary Sci. Rev., 11, 439–448, 1992. Railsback, L. B., Gibbard, P. L., Head, M. J., Voarintsoa, N. R. G., and Toucanne, S.: An optimized scheme of lettered marine isotope substages for the last 1.0 million years, and the climatostratigraphic nature of isotope stages and substages, Quaternary Sci. Rev., 111, 94–106, 2015. Rasmussen, S. O., Bigler, M., Blockley, S. P. E., Blunier, T., Buchardt, S. L., Clausen, H. B., Cvijanovic, I., Dahl-Jensen, D., Johnsen, S. J., Fischer, H., Gkinis, V., Guillevic, M., Hoek, W. Z., Lowe, J. J., Pedro, J., Popp, T., Seierstad, I., Steffensen, J. P., Svensson, A. M., Vallelonga, P., Vinther, B. M., Walker, M. J. C., Wheatley, J. J., and Winstrup, M.: A stratigraphic framework for robust naming and correlation of past abrupt climatic changes during the last glacial period based on three synchronized Greenland ice core records, Quaternary Sci. Rev., 106, 14–28, 2014. Raymo, M. E., Ruddiman, W. F., Backman, J., Clement, B. M., and Martinson, D. G.: Late Pliocene variation in Northern Hemisphere ice sheets and North Atlantic deep water circulation, Paleoceanography, 4, 413–446, 1989. Regattieri, E., Zanchetta, G., Drysdale, R. N., Isola, I., Hellstrom, J. C., and Roncioni, A.: A continuous stable isotope record from the penultimate glacial maximum to the Last Interglacial (159-121 Ka) from Tana Che Urla Cave (Apuans Alps, central Italy), Quaternary Res., 82, 450–461, 2014. Regattieri, E., Giaccio, B., Galli, P., Nomade, S., Peronace, E., Messina, P., Sposato, A., Boschi, C., and Gemelli, M.: A multi-proxy record of MIS 11–12 deglaciation and glacial MIS 12 instability from the Sulmona Basin (central Italy), Quaternary Sci. Rev., 132, 129–145, 2016. Regattieri, E., Giaccio, B., Nomade, S., Francke, A., Vogel, H., Drysdale, R. N., Perchiazzi, N., Wagner, B., Gemelli, M., Mazzini, I., Boschi, C., Galli, P., and Peronace, E.: A Last Interglacial record of environmental changes from the Sulmona Basin (central Italy), Palaeogeogr. Palaeocl., 472, 51–66, 2017. Rioual, P., Andrieu-Ponel, V., Rietti-Shati, M., Battarbee, R. W., Beaulieu, J. L. de, Cheddadi, R., Reille, M., Svoboda, H., and Shemesh, A.: High-resolution record of climate stability in France during the last interglacial period, Nature, 413, 293–296, 2001. Rousseau, D.-D., Hatte, C., Guiot, J., Duzer, D., Schevin, P., and Kukla, G.: Reconstruction of the Grande Pile Eemian using inverse modeling of biomes and δ13C, Quaternary Sci. Rev., 25, 2806–2819, 2006. Sadori, L., Koutsodendris, A., Panagiotopoulos, K., Masi, A., Bertini, A., Combourieu-Nebout, N., Francke, A., Kouli, K., Joannin, S., Mercuri, A. M., Peyron, O., Torri, P., Wagner, B., Zanchetta, G., Sinopoli, G., and Donders, T. H.: Pollen-based paleoenvironmental and paleoclimatic change at Lake Ohrid (south-eastern Europe) during the past 500 ka, Biogeosciences, 13, 1423–1437, https://doi.org/10.5194/bg-13-1423-2016, 2016. Sadori, L., Koutsodendris, A., Panagiotopoulos, K., Masi, A., Bertini, A., Combourieu-Nebout, N., Francke, A., Kouli, K., Kousis, I., Joannin, S., Mercuri, A. M., Peyron, O., Torri, P., Wagner, B., Zanchetta, G., Sinopoli, G., and Donders, T. H.: Pollen data of the last 500 ka BP at Lake Ohrid (south-eastern Europe), PANGAEA, https://doi.org/10.1594/PANGAEA.892362, 2018. Sánchez-Goñi, M. F.: 13 – Introduction to climate and vegetation in Europe during MIS5, Developments in Quaternary Sciences, 7, 197–205, 2007. Sánchez-Goñi, M. F., Eynaud, F., Turon, J. L., and Shackleton, N. J.: High resolution palynological record off the Iberian margin: direct land-sea correlation for the Last Interglacial complex, Earth Planet. Sc. Lett., 171, 123–137, 1999. Sánchez-Goñi, M. F., Turon, J. L., Eynaud, F., Shackleton, N. J., and Cayre, O.: Direct land/sea correlation of the Eemian, and its comparison with the Holocene: a high-resolution palynological record off the Iberian margin, Geologie Mijnbouw, 79, 345–354, 2000. Sánchez-Goñi, M. F., Loutre, M. F., Crucifix, M., Peyron, O., Santos, L., Duprat, J., Malaizé, B., Turon, J. L., and Peypouquet, J. P.: Increasing vegetation and climate gradient in Western Europe over the Last Glacial Inception (122–110 ka): data-model comparison, Earth Planet. Sc. Lett., 231, 111–130, 2005. Sánchez-Goñi, M. F., Bakker, P., Desprat, S., Carlson, A. E., Van Meerbeeck, C. J., Peyron, O., Naughton, F., Fletcher, W. J., Eynaud, F., Rossignol, L., and Renssen, H.: European climate optimum and enhanced Greenland melt during the Last Interglacial, Geology, 40, 627–630, 2012. Shackleton, N. J., Chapman, M., Sánchez-Goñi, M. F., Pailler, D., and Lancelot, Y.: The classic marine isotope substage 5e, Quaternary Res., 58, 14–16, 2003. Sinopoli, G., Masi, A., Regattieri, E., Wagner, B., Francke, A., Peyron, O., and Sadori, L.: Palynology of the Last Interglacial Complex at Lake Ohrid: palaeoenvironmental and palaeoclimatic inferences, Quaternary Sci. Rev., 180, 177–192, 2018. Sirocko, F., Seelos, K., Schaber, K., Rein, B., Dreher, F., Diehl, M., Lehne, R., Jager, K., Krbetschek, M., and Degering, D.: A late Eemian aridity pulse in central Europe during the last glacial inception, Nature, 436, 833–836, 2005. Tarasov, P. E., Cheddadi, R., Guiot, J., Bottema, S., Peyron, O., Belmonte, J., Ruiz-Vasquez, V., Saadi, F., and Brewer, S.: A method to determine warm and cool steppe biomes from pollen data; application to the Mediterranean and Kazakhstan regions, J. Quaternary Sci., 13, 335–344, 1998. Ter Braak, C. J. F. and van Dam, H.: Inferring pH from diatoms: A comparison of old and new calibration methods, Hydrobiologia, 178, 209–223, 1989. Ter Braak, C. J. F. and Juggins, S.: Weighted averaging partial least squares regression (WA-PLS): An improved method for reconstructing environmental variables from species assemblages, Hydrobiologia, 269/270, 485–502, 1993. Turner, C.: Formal status and vegetational development of the Eemian interglacial in northwestern and southern Europe, Quaternary Res., 58, 41–44, 2002. Turney, C. S. and Jones, R. T.: Does the Agulhas Current amplify global temperatures during super-interglacials?, J. Quaternary Sci., 25, 839–843, 2010. Tzedakis, P. C.: Vegetation Change through Glacial-Interglacial Cycles: A Long Pollen Sequence Perspective, Philos. T. R. Soc. Lond. B, 345, 403–432, 1994. Tzedakis, P. C.: The last climatic cycle at Kopais, central Greece, J. Geol. Soc., 156, 425–434, 1999. Tzedakis, P. C.: Seven ambiguities in the Mediterranean palaeoenvironmental narrative, Quaternary Sci. Rev., 26, 2042–2066, 2007. Tzedakis, P. C., Andrieu, V., De Beaulieu, J. L., Crowhurst, S. D., Follieri, M., Hooghiemstra, H., Magri, D., Reille. M., Sadori, L., Shackleton N. J., and Wijmstra, T. A.: Comparison of terrestrial and marine records of changing climate of the last 500,000 years, Earth Planet. Sc. Lett., 150, 171–176, 1997. Tzedakis, P. C., McManus, J. F., Hooghiemstra, H., Oppo, D. W., and Wijmstra, T. A.: Comparison of changes in vegetation in northeast Greece with records of climate variability on orbital and suborbital frequencies over the last 450 000 years, Earth Planet. Sc. Lett., 212, 197–212, 2003. Vogel, H., Wagner, B., Zanchetta, G., Sulpizio, R., and Rosén, P.: A paleoclimate record with tephrochronological age control for the last glacial-interglacial cycle from Lake Ohrid, Albania and Macedonia, J. Paleolimnol., 44, 295–310, 2010. Wagner, B., Wilke, T., Francke, A., Albrecht, C., Baumgarten, H., Bertini, A., Combourieu-Nebout, N., Cvetkoska, A., D'Addabbo, M., Donders, T. H., Föller, K., Giaccio, B., Grazhdani, A., Hauffe, T., Holtvoeth, J., Joannin, S., Jovanovska, E., Just, J., Kouli, K., Koutsodendris, A., Krastel, S., Lacey, J. H., Leicher, N., Leng, M. J., Levkov, Z., Lindhorst, K., Masi, A., Mercuri, A. M., Nomade, S., Nowaczyk, N., Panagiotopoulos, K., Peyron, O., Reed, J. M., Regattieri, E., Sadori, L., Sagnotti, L., Stelbrink, B., Sulpizio, R., Tofilovska, S., Torri, P., Vogel, H., Wagner, T., Wagner-Cremer, F., Wolff, G. A., Wonik, T., Zanchetta, G., and Zhang, X. S.: The environmental and evolutionary history of Lake Ohrid (FYROM/Albania): interim results from the SCOPSCO deep drilling project, Biogeosciences, 14, 2033–2054, https://doi.org/10.5194/bg-14-2033-2017, 2017. Wang, P., Tian, J., and Lourens, L.: Obscuring of long eccentricity cyclicity in Pleistocene oceanic carbon isotope records, Earth Planet. Sc. Lett, 290, 319–330, 2010. Woillard, G.: Grande Pile Peat Bog: a continuous pollen record for the last 140.000 years, Quaternary Res., 9, 1–21, 1978. Zagwijn, W. H.: An analysis of Eemian climate in Western and Central Europe, Quaternary Sci. Rev., 15, 451–469, 1996. Zanchetta, G., Drysdale, R. N., Hellstrom, J. C., Fallick, A. E., Isola, I., Gagan, M., and Pareschi, M. T.: Enhanced rainfall in the western Mediterranean during deposition of sapropel S1: Stalagmite evidence from Corchia Cave (Central Italy), Quaternary Sci. Rev., 30, 279–286, 2007. Zanchetta, G., Regattieri, E., Giaccio, B., Wagner, B., Sulpizio, R., Francke, A., Vogel, H., Sadori, L., Masi, A., Sinopoli, G., Lacey, J. H., Leng, M. J., and Leicher, N.: Aligning and synchronization of MIS5 proxy records from Lake Ohrid (FYROM) with independently dated Mediterranean archives: implications for DEEP core chronology, Biogeosciences, 13, 2757–2768, https://doi.org/10.5194/bg-13-2757-2016, 2016. Zanchetta, G., Baneschi, I., Francke, A., Boschi, C., Regattieri, E., Wagner, B., Lacey, J. H., Leng, M., J., Vogel, H., and Sadori, L.: Evidence for carbon cycling in a large freshwater lake in the Balkans over the last 0.5 million years using the isotopic composition of bulk organic matter, Quaternary Sci. Rev., 202, 154–165, https://doi.org/10.1016/j.quascirev.2018.10.022, 2018. Climate changes occur today as they occurred in the past. This study deals with climate changes reconstructed at Lake Ohrid (Albania and FYROM) between 160 000 and 70 000 years ago. Climate reconstruction, based on a high-resolution pollen study, provides quantitative estimates of past temperature and precipitation. Our data show an alternation of cold/dry and warm/wet periods. The last interglacial appears to be characterized by temperatures higher than nowadays.